I've been home a week now. I was released from the hospital last Friday after 5 days of chemo. Maybe it is because I'm young or maybe it is because it was my first round of chemo, but everyday during the hours I was getting the chemo, I actually felt better. While I wasn't getting the chemo I felt weak and tired. It could also have been all the medications I was getting against pain, nausea and other side effects that were helping me. I don't know, I just found it a little strange. The night I released was the toughest night I've had. I felt fine when I left the hospital around 6-7pm, but then the pain started to get strong. It was the worst in that week, and the worst in months. I think I skipped some of the pain medication before I left the hospital because I wasn't feeling any pain. I was excited to go home, and I felt like I don't need anything right then at that moment. "I'll be fine" I thought to myself. I woke up multiple times during the night. I puked a little at one of those times. I think I was trying to puke because I was feeling nauseous. All these medications can cause some hallucinations, and I think I woke up a few times quite confused. They installed a port in my right upper chest last Tuesday. What's a port in medicine? A port (or portacath) is a small medical appliance that is installed beneath the skin. 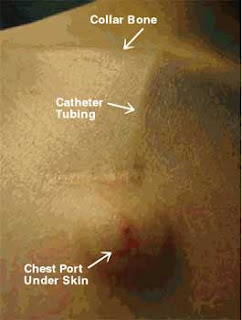 A catheter which is a flexible tube inserted through a narrow opening into a body cavity connects the port to a vein. Under the skin, the port has a septum through which drugs can be injected, and blood samples can be drawn many times. It is usually with less discomfort for the patient than a more typical "needle stick". You can read more about it here. In the first few nights at home the port was making it very difficult to fall asleep because I sleep on my stomach. It's getting better now. Taking all these preventative drugs can be very heavy on the body. It's hard to focus, it's hard to sit and do things. Things like reading a book, or writing a post for the blog. I think the pain medications are causing my to feel fuzzy, it effects my vision a little. I kind of see something like the stars you see when a cartoon character gets hit in the head. I think the first night was also very hard spiritually. I was feeling good when I left the hospital, then 2-3 hours later, when I was home I started feeling bad mainly because of the pain. I was thinking "Is this what's it going to be after every round, for 5 months now? And what if 6 rounds won't be enough? What if I will have to find a different chemo?" My ima (mom) is amazing. I don't know how I would have gone through all this without her. It's is not easy to be so dependent on someone else. I'm dependent on my ima, the doctors, the nurses, the medications. For the medications I have a chart where it says what I need to take, when, what amount, and I record what time I took what and how much. For the pain medications it is more up to me. When I'm in the hospital I'm in a shared room with another cancer patient which depending on who you share the room with can make it very uncomfortable. Luckily during the first round I didn't suffer from my roommates, but I fear at one of those rounds I will get some annoying roommates. My energy level isn't high (and expected to get even lower), so it is hard to do basic things like making food. I think the port has made it even harder to swallow, at least it did for the first few days, I think it is better now, I just have to remember to chew longer than usually. But again, I'm pretty much dependent on someone to help me with going grocery shopping and cooking. My ima, again, is amazing. Both my parents are very helpful, each in their own way. It would have been hard with no parents to help me. It is hard not to think ahead, say 20 years from now, suddenly another cancer, then what? My parents will be too old, hopefully I'll have someone new in my life, a woman, to help go through it. Even if I would, it would be tough on her. Having to work, raise kids, and take care of her man too almost all day. When I'm in pain, it's hard to stay spiritually up because I'm thinking this is just week one. I try to bounce out of it, talking to myself "you are strong, you are whole, you are healthy" something like that. I believe we, humans, can do wonders with our subconsciousness, but it's hard to keep up with it. You gotta be telling yourself some prayer again and again every day for a few months to see results. You got to find a time of day and do it. And if you don't truly believe talking to your subconsciousness can do anything, it is hard to get yourself to do it. I believe, but I'm just maybe too lazy, just don't feel like it at times, I forget, just want things to happen without having to work for them. The last two days have been great. Pain is getting a lot better. There are two types of pain medications that I was taking. Long and short. The long one I'm suppose to take very 12 hours. The short one is for extra boost, and I can take it every 4 hours. I went outside, ate outside, went with my ima to do some grocery shopping, and more. I'm even getting back to myself where I'm procrastinating stuff. Like posting here on my blog. I have other things I wanted to share that happened this past week. 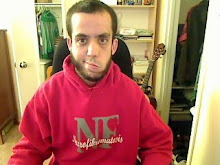 I shave my head, I bought PlayStation 3, my ima is showing me how to knit, and more... But like I just before, and if I haven't then I'll say it again, when I have too many ideas, I get overwhelmed. I want to put things in a chronicle order I want to make sure the post makes sense, that I'm not repeating myself, etc (it's the perfectionist part of me reaching out). Ok I think I'll stop here. I'll try to say more about the other things I had in mind later today or tomorrow, or the day after... (-: Right now I need to eat something, and then I'm going to go see The Avengers with a friend. I was advised to go during empty early showings, so were going at 12:30pm on a Thursday. Hope your week is going well, thanks again for reading. Toda Raba for reading! I appreciate every single reader, and it is the readers that fuel me, so that I can keep writing.